Aunt Mag's Adventures in Quilting: Happy New Year! When I look at my blog, I realize how much has happened since my last post. Of course, I hardly stopped to breathe during the last two months! My how the time does fly!!! On the other side of that coin I can look at how much I have accomplished during this time. So, my "blog-neglect" has been worth it! Truthfully, housework & PC went out the window - pared down to essentials - like food, which my hubby certainly appreciated... LOL! 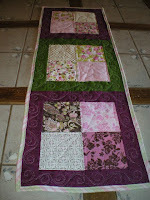 Looking back - I finished 8 table runners, a table topper for Thanksgiving & completed 3 quilts. One t-shirt memory quilt as a sample, helped a friend make & complete a t-shirt quilt for Christmas and quilted it for her - it's a monster - finished king size! And the best part of all - I finished my Foolish Goose Tracks "Block-of-the-Month" Queen sized quilt for my son. It was his Christmas gift and was on his bed the same day. It is beautiful & he says he really loves sleeping under it! Oh, I nearly forgot .... I also played with my scraps and made three journal covers. They were SO much fun! I definitely plan to make more of those in the future. If you click on the detail you might be able to see the fleur de lis quilting & echoes in the purple, gold & white calico.... just a perfect fabric for my LSU theme! And this is the last one for 2009.... a gift for a dear friend... guess there are others too, now that I think about ... LOL! I was a prolific table runner maker for a season! It was nice to be able to give gifts that I had made for each of my dearest friends & family members... What a blessing for me this year! This is the Foolish Goose Tracks quit completely finished. The quilting work came out just fabulous if I must say so myself!! I love this quilt and was quite a feeling of accomplishment when the last of the binding was stitched down! The images below are detail of some of the machine quilting.... took me a couple of day of hard work, but what a great feeling! & a few other little detours, like Christmas shopping & some PTO responsibilities... Okay, maybe I need a nap now that I've written all that down..... and I wonder why I'm in "sleep-in" mode now that it is all done & delivered! LOL! Wishing everyone a Happy New Year! Looking forward to what God has for me and more "Adventures in Quilting" in 2010!